The residencies are usually between three weeks and three months. During that time artists are expected to produce prints in any of the four standard areas: etching, serigraphy, lithography and relief. They are provided with studios, basic supplies, 24/7 access to the workshop and the help of technicians. 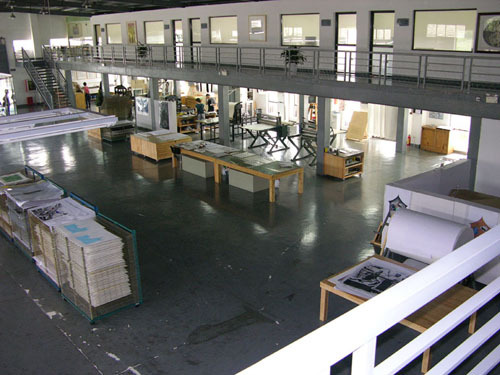 Guanlan Print Studio – what’s like to have all this space to work? The artists are provided food and housing in the nearby 300 year old Hakka Village. The Chinese government has essentially created a printmaking village with the idea of making Guanlan a major center of printmaking. Frequently foreign and Chinese artists from outside the area visit the workshop. They are often given tours by Mr. Li Kang and Mr. Zhao Jiachun, the administrators who organize residencies and work with artists. There are studios, galleries, exhibition spaces and framers, as well as a coffee shop and post office in the village. Guanlan is in southern China, not far from Hong Kong. It is very close to the famous Mission Hills Golf Course and city of Shenzhen, itself a major center with a population greater than that of New York. This entry was posted in Uncategorized and tagged debora ando, etching, printmaking, residency. Bookmark the permalink.